Donald Trump has hit the ground running. For those of us who thought he would moderate after the pre-election rhetoric, we were wrong. He has bunkered down with a fortress America mentality. He has surrounded himself with like-minded individuals – climate sceptics, xenophobes, ex-bankers etc. The lunatics are in charge of the asylum. Trump’s policies will hurt the US. If he puts up trade barriers other countries such as China will reciprocate. This could lead to trade wars and we know protectionism was a contributor to the Great Depression. He isn’t afraid of a trade war. The fact is the US has low unemployment and low inflation at the moment. In 2009 unemployment rose to over 10%. Now it is half that. Trump’s policies will not reduce unemployment, they will cause it. Trump’s mantra is “make America great again”. Great compared to when? The post WWII days when the Marshall plan was implemented to rebuild Europe? Then the US was outward looking. Or is he referring to some other period – perhaps the early 20th century when it was a manufacturing powerhouse – the world’s largest producer of steel, automobiles, oil. But the world has changed – it is now an interrelated global economy – countries depend on each other. Supply chains are global. Trump is turning the US focus inwards. I think his problem is he can’t handle that the US is not as relevant as it used to be. Sure it’s still the largest economy in the world, but that mantle’s under threat and it’s only a matter of time before China resumes its rightful place as the planet’s largest economy – a place it occupied for 1800 of the last 2000 years. And in another few decades India will be number two, which it occupied for just as long. If Trump’s first weeks are anything to go by we’re in for an interesting four years – if he lasts that long. “Beginning today the United States of America gets back control of its borders,” Mr Trump declared during a visit to the Department of Homeland Security. Making it more difficult to travel to the US is not getting control of its borders. Robert Shiller is a Nobel prize winning economist. 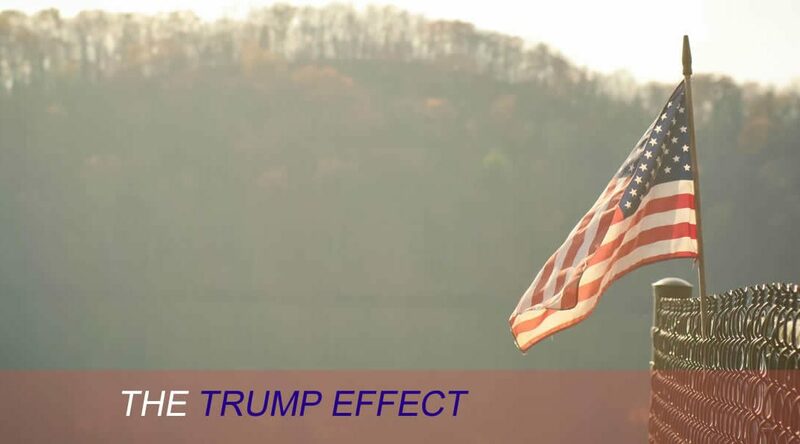 In recent months he has said that there will be a Trump effect: he is a business oriented president who wants to cut corporate taxes and regulations. He wants to get rid of red tape that blocks businesses being able to do business. That may be a good thing for business America. This will take stock prices higher – which it has done. Between the election and the inauguration US stocks rose 8.5%. There is a chance, however, that Trump could take the US into the next “Great Crash”. He uses the following example: Trump’s “go out and spend” mantra may entice, but does he feel it will sate voters long-term? “Their support is not unconditional. Once things go wrong, I fear that things could turn very bad for the markets,” he said. “What happened after 1929 is a sobering tale. American attitudes changed abruptly. People cut back on spending and this compounded the effects of the depression. There was a collective repudiation of what had gone before. “There is a strong narrative to the Great Crash. People saw it as the day of judgment on the 1920s, and I think we could see a repeat of that. The public will reject Trump’s policies and what he stands for,” he said. Recessions happen because of a collective “narrative”, a story that takes hold. People spend less. They postpone buying a new car. Small businesses put off hiring. The effect snowballs into a serious downturn. His policies will produce little stimulus and further entrench inequality, and there is a real risk of a trade war. After a White House meeting with executives from Wall Street, Trump signed a directive aimed at the Dodd-Frank Act, introduced by the Obama in response to the 2008 meltdown. He also signed a memorandum that paves the way for reversing a policy, known as the fiduciary rule, that requires brokers to act in a client’s best interest, rather than seek the highest profits for themselves, when providing retirement advice. “We expect to be cutting a lot out of Dodd-Frank because, frankly, I have so many people, friends of mine that had nice businesses, they can’t borrow money,” Trump said in the State Dining Room during his meeting with business leaders. This sounds like a bloke in a pub talking with his mates. Most pub talk is uninformed and this is no exception. The fact is business and consumer lending has been expanding. In addition, the Volker rule, which limits banks’ ability to trade with their own money and was one of the main causes of the financial crisis, is in danger of being repealed. In 1999 the Clinton administration repealed the Glass-Steagall Act which was put in place after the Great Depression and separated investment and retail banking activities. It had been whittled down over decades but once repealed it was game on in the banking sector which leveraged off balance sheets to place big bets on financial instruments. Within a decade, we had the financial crisis. Trump has hired senior bankers from Goldman Sachs to advise him on financial matters. Steve Munchin is his nominee for Treasury secretary; Gary Cohn is his chairman of the national economic council; and Stephen Bannon is his chief strategist. Are these advisers likely to put in place measures to curb banking activities? While this remains to be seen, we can only hope that common sense will prevail and banks will be regulated in a prudent manner.